In 1690, Job Charnock returned to England after two successive attempts to establish a business base in Bengal. The British did not give up so easily and in 1696, the East India Company obtained the rights to build a fort in the vicinity of modern Kolkata from the Nawab of Subah Bangal. The English trading company wanted to build a fort in Kolkata to strengthen their hold in this region of India. In the later part of the 17th Century, while the other European colonisers established their strongholds along the fertile South West Coast of the Ganges, the English preferred the South Eastern coast of the Ganges mired with swamps and forests, dotted with little hamlets of fishermen and weavers. Despite the problems, including epidemics, they faced, the English clung to Kolkata. They had the foresight to see the immense potential of this place. 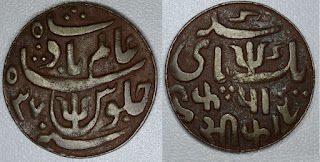 In 1717, the East India Company obtained the rights to trade in Kolkata for a paltry yearly sum of 3000 INR. In 1757, after the Battle of Plassey, the English cleared up the Gobindopur region and built Fort William. Within 1803, the layout of the White Town was made, including the modern Dalhousie Square, Esplanade, Lalbazaar, Chowringhee, Park Street, and Birji Talao. It included the Palace of the Viceroy, the modern Raj Bhavan, the Writer's Building, the Supreme Court, the modern High Court, the Counsel House, the Town Hall and other important buildings. To the North, South and East of the White Town stretched the Black Town or the living quarters of the natives. The Black Town comprised a few palaces of the zamindars and babus, and thatched huts of the common people. In 1858, after the Sepoy Mutiny, India passed on from Company to the British Crown and Victoria became the Empress of India. The Victoria Memorial was conceptualised by Lord George Curzon, Viceroy of India, to commemorate the reign of Queen Victoria, the first Empress of India, after her death. Built from 1906 to 1921 in the Indo-Saracenic Revivalist style, it was designed by William Emerson, the President of Royal Institute of British Architects blending British architectural style with Egyptian, Venetian, Deccani, Mughal and other Islamic styles. Built of Makrana marble, it measures 103 metres by 69 metres, with a height of 56 metres. The gardens surrounding the Memorial spreading over 64 acres are designed by Sir David Prain and Lord Redesdale. 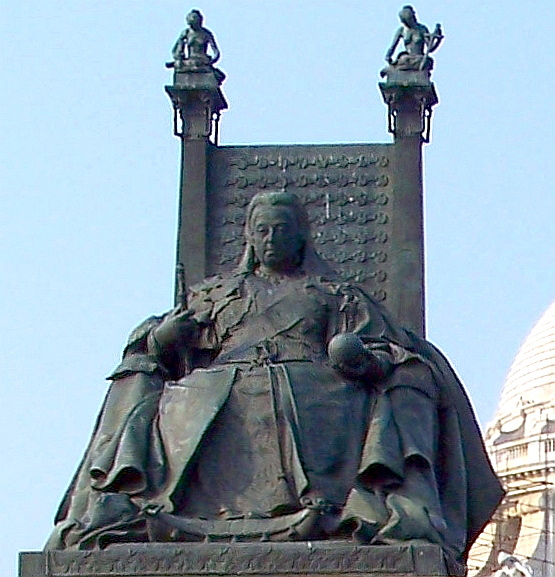 At the entrance of the Memorial is a dark bronze cast statue of an elderly Queen Victoria sitting on a throne wearing robes with the Star of India. There is another statue of the Queen made of white marble, just as we enter the Memorial, portraying a younger Queen at the peak of her beauty. At the top of the dome of the Memorial is the Angel of Victory, a black bronze angel with a bugle in her hand on a pedestal, which rotates as the wind blows. Today, the Memorial is a Museum, encapsulating the glories of a bygone era, relics that recount the history of Kolkata. With the changing times, new additions have been made to the museum, and new galleries have been added. 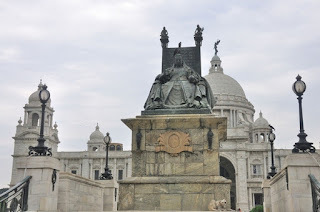 There are 25 galleries inside the Victoria Memorial, some of them being the Royal Gallery, the Sculpture Gallery, the Central Hall, the Portrait Gallery, the Arms and Armoury Gallery and the Calcutta Gallery. The Royal Gallery contains several portraits of Queen Victoria and her consort Prince Albert, and oil paintings representing various incidents of their lives. The Calcutta Gallery was added in the 1970s, providing a glimpse of the Calcutta that was and its gradual development. The Victoria Memorial houses an astounding collection of paintings, artefacts, weapons, textiles, coins, stamps and maps of those times. Among the exhibits of the Museum are also the writing desks and chairs of Queen Victoria and her scrapbooks, and a rare collection of books and manuscripts. A number of painters came from England to explore and document the new colony in the eighteenth and nineteenth centuries, and a collection of their works is on display at the Museum. In 1784, Thomas Daniell and his nephew William Daniell came to India and the pair composed countless sketches and charcoal and ink illustrations. In 1794, they returned to England and published paintings and individually coloured aquatints featuring landscapes and other scenery they had captured during their stay in India. These works reveal much about Indian society as they saw it and the British life in India. 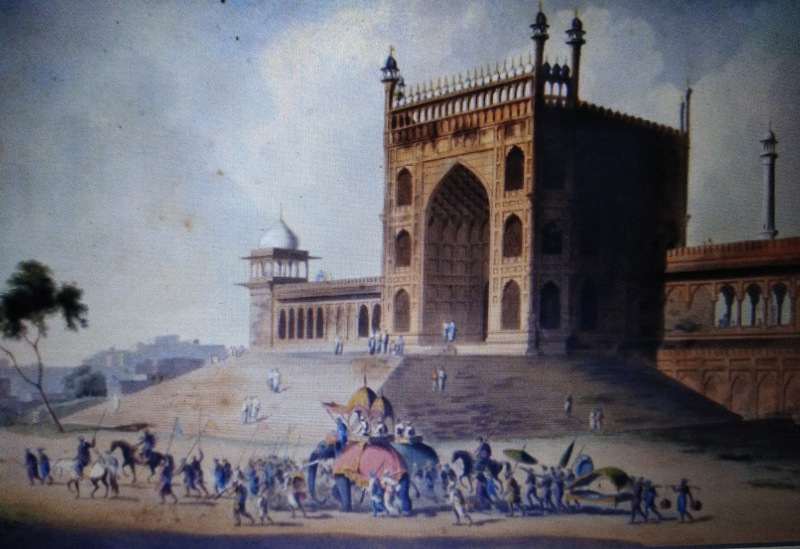 When the Daniells came to India, the East India Company had just captured parts of India and the Mughal power was waning. The signs of warfare, death and social disruption in their paintings are always overlaid by the beauty of the land, and the fears, the socio-political realities experienced by the Britons living in India are concealed. The streetscapes in these paintings depict streets from the White Town, lined with white British Neo-classical buildings, or Oriental architecture, interspersed with figures of people of South Asian and European origin as well as palanquins, carts and elephants. 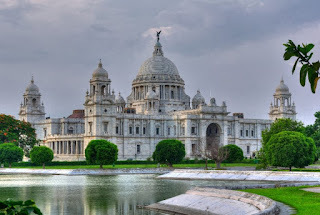 To the Daniells, Kolkata was a lively urban melange of European and Oriental manners with spacious streets, presenting inexhaustible variety and amusement. 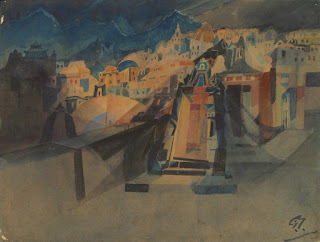 The expansive sky in each painting, a direct contrast to the crowded European cities, highlights the vastness of India. Today, the India that they painted no longer exists, but the river ghats, the temples, the ports, the mosques, the palaces, the placid sceneries that they captured endure. Tilly Kettle was an English portrait painter who visited India and spent the years 1769-76 in the subcontinent. She painted portraits of nabobs and princes, and a collection of her portrait paintings are preserved in the Victoria Memorial. Among these are the portraits of Shuja-ud-Daula in the Durbar Hall of the Victoria Memorial and a photograph of her portrait of Elijah Impey. 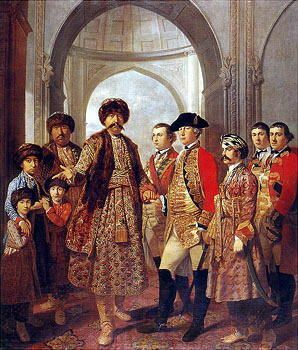 The Nawab of Oudh, Shuja-ud-Daula is pictured with his four sons, General Baker and British military officers in a Renaissance style composition, while Elijah Impey is portrayed alone, against a dark background. Johan Zoffany, another portrait painter who visited India during the reign of Queen Victoria, has a collection of paintings at the Victoria Memorial. 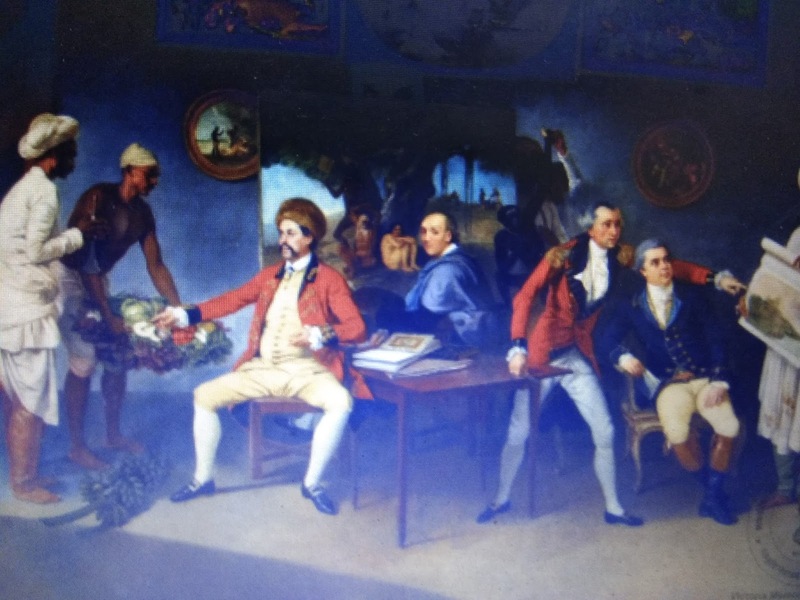 One of them titled Colonel Antoine Polier, Claude Martin, and John Wombwell with the Artist, painted between 1786 and '87, is an oil painting on canvas, depicting Colonel Antoine Polier, Claude Martin, and John Wombwell and the artist himself in the background being waited on by Indian servants. His style is neoclassicist. Emily Eden, yet another artist used watercolour on paper and her paintings depict the entire cross-section of the Indian society. Some of her sketches were printed in the form of lithographs. She recorded minute details about the Indians and in her paintings, and we see intimate studies of Indians of the time. Some of her paintings are exhibited by the Museum. The Kalighat Paintings were executed on paper by a group of artists called the Patuas, who set up shop around the vicinity of the Kali temple at Kalighat in the 19th and early 20th centuries. A collection of these paintings meant as souvenirs for pilgrims, feature as exhibits in the Museum. The paintings, known as pats, made with a bold sweep of the brush depicted deities, as well as socio-political events of the Victorian Era seen through the eyes of the sub-altern. 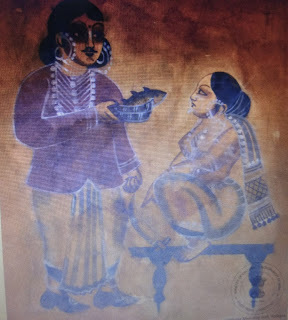 Therefore, they portrayed the British and the Bengalis, and made commentaries on local scandals, and even portray a babu carrying his educated wife on his shoulders and leading his mother on a leash, showing the ill effects of female education. Before the advent of the English, the pats usually depicted a deity without any background or midground. After the advent of the theatre and the picture-frame stage from Europe, the figures were drawn with elaborate midground, background and curtains framing them. Abandindranath Tagore one of the founders of the Bengal School of Art, is known as the Father of Modern Indian Art. A collection of his paintings at the Victoria Memorial includes samples from his entire oeuvre. His Bharat Mata in Wash technique is a protest against the British rule. 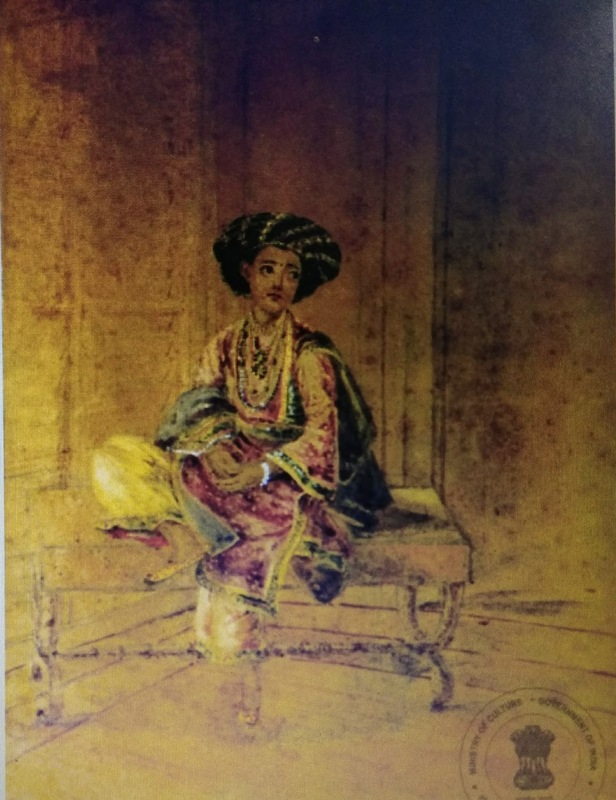 He synthesises and modernises Mughal and Rajput styles in order to counter the influence of Western schools of art in India and his themes are deliberately Indian. Gaganendranath Tagore was influenced by Japanese and Chinese art, and also created a style which approximates to Cubism. 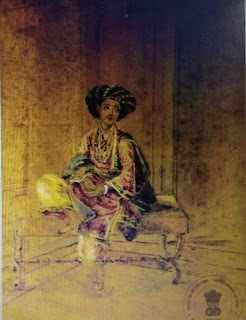 The paintings housed by Victoria Memorial contain his depictions of the Jorashanko Tagore residence, mostly in black ink and brush, highlighting the effects of chiaroscuro, studies of Orissa temples, in Wash technique, the Cubist paintings executed in the 1920s, in which he transforms his world into simple geometric shapes, his satirical drawings of the Bengali babus and ladies imitating the British. 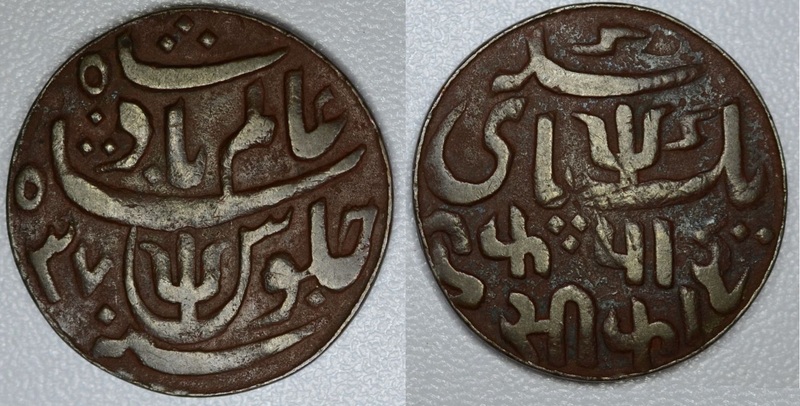 Lord Curzon wanted to assimilate coins from different empires that ruled India in different phases of history as a record of information about the times they belong to, the rulers and the socio-economic status of the kingdoms. 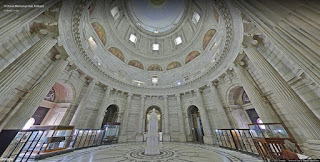 There is a sizeable collection of coins in the Victoria Memorial Hall belonging to various phases of Indian history. 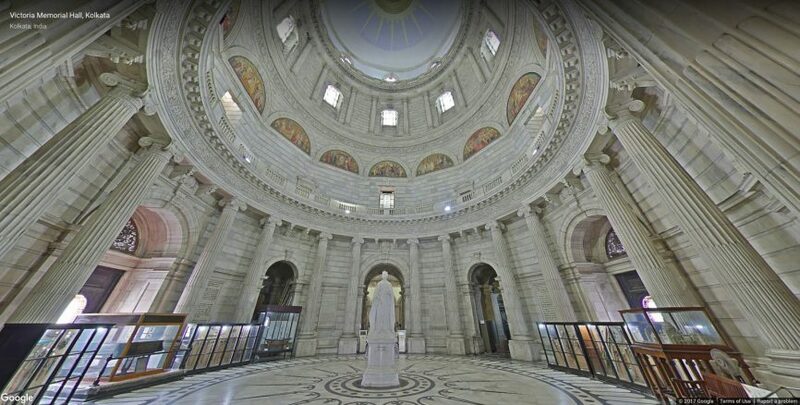 There are many rare ancient manuscripts in the Victoria Memorial Collection, including the Gita Govinda, the Begum of Bhopal's calligraphy, a fragment of Abul Fazl's Ain-i-Akbari, the Akbar Nama, Wajid Ali Shah's calendar, Rubaiyat of Omar Khayyam, to mention a few. The languages of the manuscripts range from Sanskrit to Pali, Persian and Arabic to Urdu. The colonised always ape the colonisers. Therefore, the Romans aped the Greeks, and the English accepted the Greco-Roman pantheon after Julius Caesar invaded Britain in 54 BCE. The colonisers believed that some divine decree had sent them to civilise their colonised. After the conquest of England, statues of the Roman Emperor and the generals were set up endowing them with supernatural abilities of Greco-Roman heroes, to prove the colonisers' superiority. England was Christianised long before India was colonised, but the statues set up by the British reflected the Roman influence and indicate that the British wanted to create a "Colonial Olympus" (Openty Bioscope, CAMP: Sovon Som) in India. The statue of Lord Curzon, who was appointed Viceroy of India in 1899, portrays him as a Roman Senator, wearing a mantle and decorated with a medal. The statue is made of marble by Frederick William Pomeroy. Curzon took measures to improve education, irrigation, police and other branches of administration. However, his policy of forceful control made him unpopular in India. During his second tenure as Governor-General, he implemented the 1905 partition of Bengal, which roused such bitter animosity among the people that it was revoked in 1911. He also did little to fight a famine that killed millions. The pedestal of his statue shows a relief work of Asians paying obeisance to British officers. The statue of Warren Hastings, the Governor in 1772 and the Governor General of Fort William, Bengal, in 1774 to 1785, was first established in the Town Hall in 1830 and transferred to the Victoria Memorial in 1914. The statue projects him as an educationist. He patronised native traditional religious education systems and established the Madrasa System. Under his encouragement William Jones established the Asiatic Society of Bengal, and Charles Wilkinson printed A Grammar of the Bengal Language by Nathaniel Halhed. 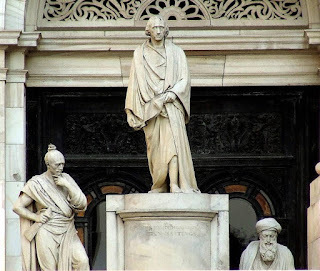 The statue shows him dressed like a Roman Senator wearing a mantle, holding a scroll symbolising education. This statue in the form of a triad has Hindu pundit standing to the right side of his feet with a scroll, and a Muslim munshi with a book sitting to his left. The statue of William Cavendish Bentinck the Governor General of Bengal from 1828, and the first Governor General of India in 1833, was first established in Kolkata in 1835 and later, shifted to the grounds of the Victoria Memorial. He suppressed the "thugees" and banned the sati. He also established the Medical College and paved the way to accept Thomas Babbington Macaulay's Reform of Education. The bronze statue shows him wearing the dress of the British Governor General, leaning on the open sword he holds in his left hand. In the pedestal, is a relief of a scene from a sati ritual while Bentinck holds the decree banning sati in his right hand. Bentinck is depicted as an Englishman and not as a Roman hero. 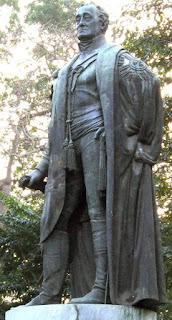 The statue of Lord Cornwallis was constructed in England and brought to Kolkata in 1803, in the same year that the Palace of the Viceroy was constructed and the Company captured Delhi defeating Shah Alam II. An excellent piece of sculpture, it was later placed in the grounds of the Victoria Memorial. 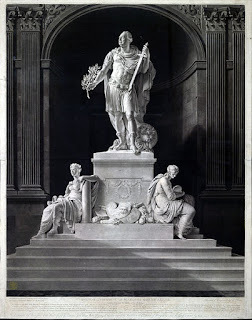 Cornwallis is dressed like a Roman General, wearing sandals and a mantle, and at his feet lies a big horn overflowing with wealth which is the cornucopia or the horn of plenty which Hercules procured from the River God, Achelous. The greatest among all Greek heroes, Hercules brought peace and prosperity to his country. Cornwallis the modern Hercules, gifted the horn of plenty, India, to the British Empire. At his feet is a lion skin signifying both the Nemean lion slain by Hercules, and the Mughal Emperor defeated by Cornwallis. The sword he holds up in his left hand resembles a Latin cross signifying the British mission of the propagation of Christian faith in the colony. In his right hand, he holds an olive branch like the victors of war and sports in ancient Greece and Rome. A triad, it has a lady holding a snake in her right hand on the right side at the feet of Cornwallis and to the left is a statue of a young nymph holding a mirror which signifies humility. In Greek mythology, the snake symbolises land. 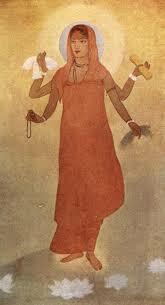 The lady signifies the system of land taxation in India Cornwallis began in India. The pedestal bears the inscription that he improved the internal resources of the country and upheld principles of "wisdom, equality... faith and moderation". During the Battle of Plassey, a great number of people gathered along the rivers to watch the battle between the English and the Indians, and none intervened to save the native rulers. When India passed from the Company rule to the Crown, a large part of Indian population welcomed the intervention as divine Providence. Ishwarchandra Gupta of the newspaper Shangbad Prabhakar hailed Queen Victoria as the mother of India. Bankim Chandra Chattopadhyay in Devi Choudhurani claimed that when India passed from the Company to the Crown, law and order was established. In such a situation, the "Colonial Olympus" was not just a collection of statues in the White Town, it was also accepted by the general population in the Black Town. It is also important to note that most of these statues and the Victoria Memorial itself, were sponsored by both the British and their Indian subjects. Building up this "Colonial Olympus" in Kolkata both established the British supremacy in the Indian psyche, and also healed the wounds that the British had acquired when they lost their colony in the United States of America in 1776 under the leadership of Cornwallis.